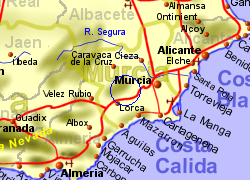 The Sierra de Espuña situated in the region of Murcia, approximately 40Km inland from the Costa Calida, offers a change of landscape to the dry and flat areas of most of the region. Much of the flat areas are however irrigated and constitute an important food growing region. 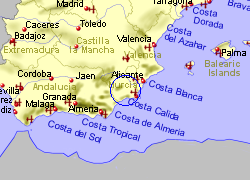 This area has a higher rainfall than the rest of Murcia and, although there are no rivers running through it there are numerous springs that feed small streams, flowing into surrounding rivers in the rainy periods (mostly winter time). This sierra is mostly covered with pine forests, with the mountain peaks rising above to a height of 1,580m, 10,000 Ha of which were declared a Nature Park in 1978. Wild life includes mouflon (similar to the mountain goat with twisted horns, having been introduced in 1970) grey squirrel, hares, wild boar, foxes, wild cats, golden eagle, sparrow hawks, goshawks, kestrel, owls. 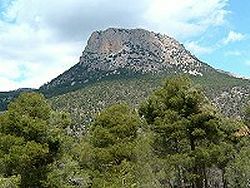 The Sierra de Espuna are accessible by road, sometimes quite tortuous, from Totatana, Alhama de Murcia from the south east or Mula from the north. 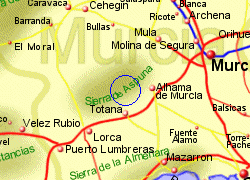 Map of the Sierra de Espuna area.